Creamy, dreamy chocolate yogurt dip and fresh raspberry topped banana bites – these come together in minutes and are eaten up even faster! These are the perfect afternoon snack. After you’ve made these easy banana bites, be sure to check out some other snacks: granola, healthy banana bread, or granola bars! These banana bites are so easy and fun to make! These have become my kid’s go-to after school snack; they beg to eat them! I’m not complaining about that because they are simple to make, healthier than a bag of chips (and plenty of other snacks), and it’s fun to involve them in the process of making these bites. You can make the chocolate pudding mixture ahead of time, so assembling this snack takes mere minutes. Pretty much whatever fruit you have on hand will go with the creamy chocolate pudding mixture and the banana. We love berries best, but get creative with these snacks! Banana slices are topped with chocolate yogurt and finished with fresh berries — you can use whatever berries you’d like such as raspberries, strawberries, blackberries, or blueberries. 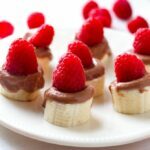 Creamy, dreamy chocolate yogurt dip and fresh raspberry topped banana bites- comes together in minutes and eaten up even faster! These are the perfect afternoon snack. 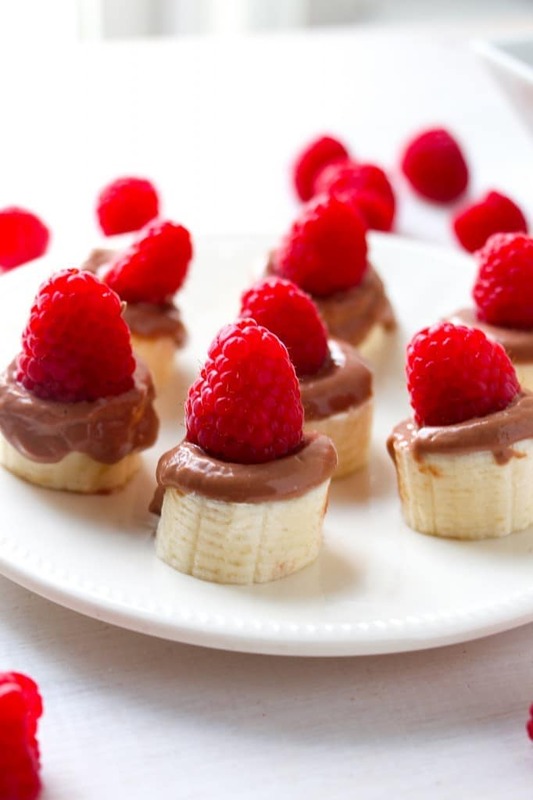 After pudding has congealed, top each banana with 1 Tablespoon of the chocolate yogurt and a raspberry. Serve immediately. If you want to make these ahead of time, prep chocolate yogurt, and assemble before serving or the bananas will turn brown and the yogurt will get watery from the raspberry. Store chocolate yogurt in an airtight container in the refrigerator for up to 5 days. Mhmmm I love hoe simple and delicious this recipe is! I always get struck by a HUGE chocolate craving as well, but usually reach for that jar of nutella and have one too many spoonfuls ;). I’ll keep this recipe in mind for the next wave of chocolate-induced craving! you are right! this recipe is so simple and easy to make! i make this for my kids all the time! These look great! So simple, yet I never would have thought of adding the three (banana, choc, raspberry) together. These bites look awesome! I’ve been having really bad snack cravings and made some frozen PB banana bite snacks! So good & I bet these are just as good if not better!